3D High Res – Help Us complete “James two” a large volume 3d printer (My 8 year old son named it).I am vary passionate about 3d printing with over 4 year of 3D printing under my belt and have been a “maker” all my life. I’m ready to undertake this build. I have done all the homework on printing at this volume and can make it viable to succeed. With a volume size with just over 1 cubic meter the builds are endless . With this printer i hope to provide my son with a stepping stone for his future. This is a work in progress and i am asking all of you with a big hearts and a soft spot for young minds, help some one help them self. A large format 3d printer from most manufactures cost huge dollars. With my experiences i can build a large format 3d printer for a fraction of the cost. Something that would cost $20000 to buy from the market, my son and i are building it in the living room. 3D Printing and manufacturing is of age, where we can manufacture products locally for a local market. with “James Two” we have some large scale products we would like to start to make and sell to help with his future. Help me fund the completion of “James Two”. James one is a CNC we built. 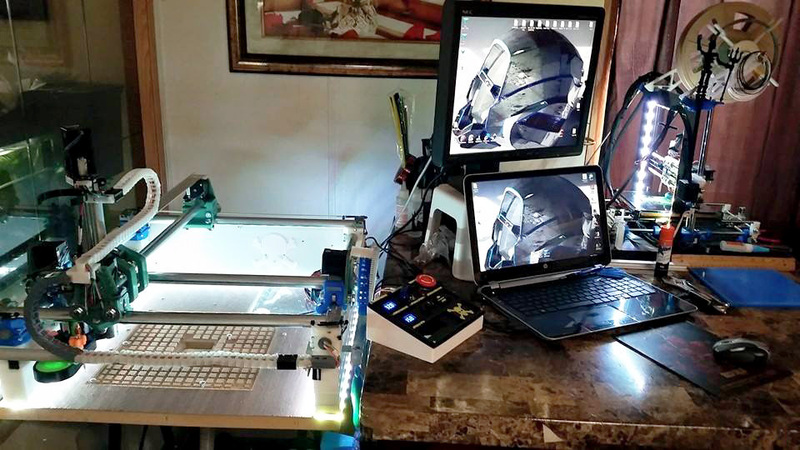 This 3D printer will provide my son with a stepping stone for his future. With a large volume 3D printer the opportunity for growth and a future where coding and makers are in demand. My son is all ready involved in coding and “James Two” has him vary excited to what he can design and make. “Dream BIG” my boy. Here is my website www.edmonton3dprints.ca that i do all the administration on. There you can see some of the prints i have completed. This is also to be a revenue stream, but is not getting the exposure needed. BOM- hardened steel rods various sizes and lengths.Threaded rods. Bearings and Bushings. Plexiglas for enclosure. Large tempered sheet glass for Print bed. Heated Bed. Stepper motors. Electronics – Stepper drives, Mother board, Display, Power source,Fans, LED lights,Thermistor, PID, End stop switches, Belts, Wire, Filament (ABS 1.75). Software. just name some of the items. If i get any funding, i will put the monies into the parts on a priority bases to keep the build moving forward. With current situation (financial) the build is at a stand still. Unique perks to be posted soon. With your generosity you will be helping Me and my Son complete this project. Create a platform that will benefit him for years to come. My son completed his first hour of code at age 7, and is taking like a duck to water with the 3d printing and design. i am involved with My Mini Factory project as a vetted printer, been using this to help fund the “James Two” Project. i have also been trying to get into the sales and service of 3d printers, but lets face it big players have that all sewn up and have not sold one. i have been a “Maker” Before the term became the norm, i have accomplished some fairly complex builds in the past, my current 3d printer, MPCNC to name a couple. One of the biggest hurtles to a printer of this size is the length of time these prints can take. I have done some R&D with my current printed and software. All be it said, the learning curve was vary steep. I have all ways liked a good challenge and will not stop till i have found the answer. The R&D for “James Two” has been complted and i’m ready to put it to the test. make some noise about our campaign hit those share buttons over there over there FB, Tweet, etc.